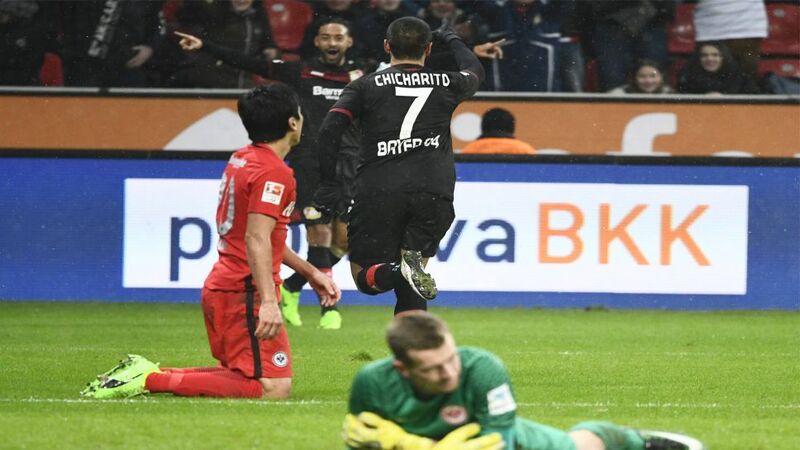 Javier 'Chicharito' Hernandez delivered a finishing masterclass to inspire Bayer 04 Leverkusen to victory over Eintracht Frankfurt at the BayArena on Matchday 20. Leverkusen made a picture-book start when Frankfurt defender Michael Hector's hurried clearance cannoned off Kai Havertz and fell invitingly for Chicharito, who made now mistake from seven yards. The Eagles soon settled into their stride, though, and would have gone in at the break with something tangible to show for their efforts level but for two fine Bernd Leno saves to deny Mijat Gacinovic and Branimir Hrgota. Frankfurt's Lukas Hradecky swatted away a fierce cross-shot from Karim Bellarabi as Leverkusen sought to double their advantage early in the second half. A headed attempt from Alexander Meier header followed at the other end, before Chicharito capped a silky team move with a sensational first-time volley to give Leverkusen daylight. The Mexico international's replacement, Kevin Volland, put the result beyond any doubt 12 minutes from normal time. It's official: Chicharito has his mojo back. After going 11 Bundesliga matches without a goal, the Mexican megastar now has three in his last two outings - and eight for the season. Class is permanent. A first win of the year and against one of the teams above them in the race for European football at that: Leverkusen's top-four dream lives on. Roger Schmidt's side are now just seven points adrift of the UEFA Champions League places. There has never been a goalless draw in 64 Bundesliga meetings between Leverkusen and Frankfurt.Leno made his 250th appearance in a Leverkusen shirt.Volland scored his first Bundesliga goal since joining Bayer in summer 2016. Click here for the Leverkusen vs. Frankfurt Match Centre!